When designing a monitoring program, always consider the spatial and temporal scale of the project. How big an area does the particular BMP affect? 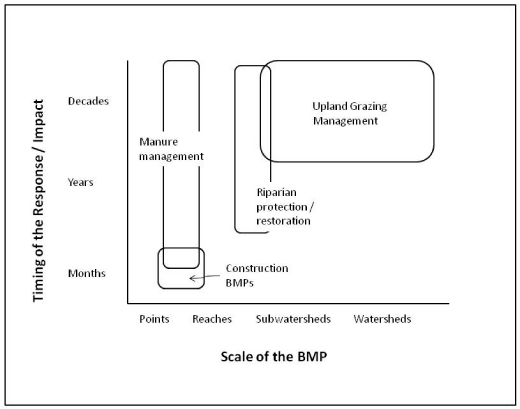 How soon after implementation will any impact of the BMP be evident? How long is the BMP expected to remain effective? Figure 1 shows some examples of the how both the scale of BMPs and the typical response time of BMPs can be quite different. For example, construction BMPs such as straw bales to control erosion typically are effective immediately but do not remain in place for extended periods after construction or other projects are completed. In contrast, the results from a willow planting project are not likely to be evident within the first few months after the willows are planted, but this BMP, once established, should continue to be effective for years. The area affected by a BMP is also a major consideration. Manure management BMPs, such as improved winter storage, might only directly affect a small reach of a river. Changes in upland grazing management, on the other hand, can affect an entire watershed but may not be immediately apparent or measurable. Figure 1. The scale of common BMPs and their typical response times should always be considered when planning a monitoring program.